The most interesting part of the Wired article is actually a revelation about some of Detroit: Become Human’s numbers. More than 250 motion capture actors were employed to portray the 513 characters present in the game’s 2000 page script. There are more than 35,000 camera shots throughout the game, and 74,000 unique animations. 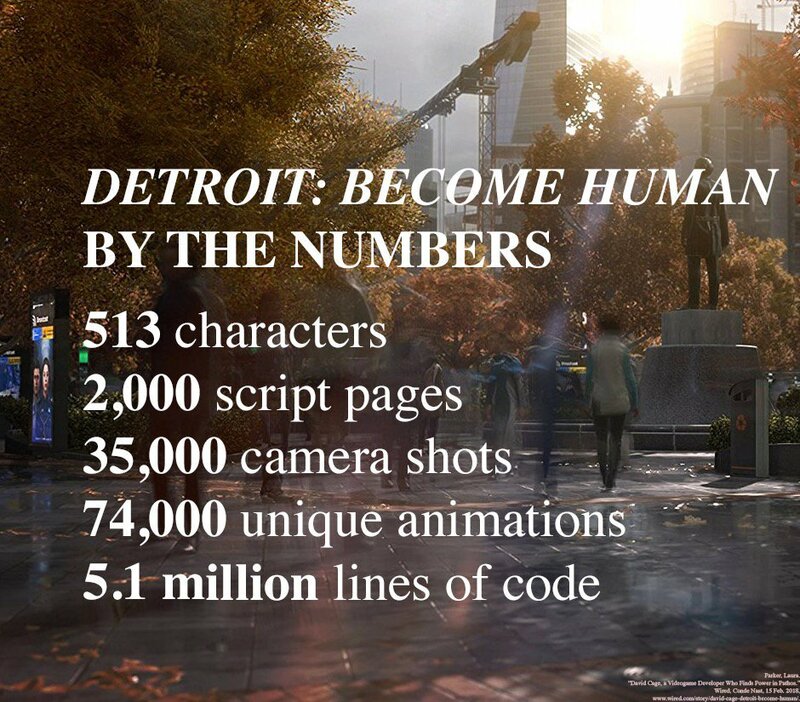 The characters, branching narrative, animations, and camera shots are all crammed into the 5.1 million lines of code that ultimately make up Detroit. All of that may seem like a lot, but the script-length is unsurprising. Quantic Dream’s Heavy Rain also boasted a script that was over 2,000 pages. Numbers shouldn’t mean everything though. A great short film or game can be just as powerful, moving, or entertaining as something that is significantly longer. The true test will be how well all of those numbers and pieces interact to create a narrative, and whether that narrative will capture the subject matter in the best way possible. A recent dust-up caused a commotion with some believing that Detroit: Become Human’s visuals had been downgraded. The downgrade was, in fact, the result of a low quality video capture. Some of the actors that will be portraying a few of those 513 characters were revealed recently, and include Clancy Brown, Lance Henrikson, and Minka Kelly.